Help?! Which shooter and which assault should I focus on? Assault: I think I should get Tis of Vincent and focus on Rutger Jimmy or Norma? Do you agree? What are your thougts? Shooter: Lente is the way to go I assume? Is there a need to keep a 2nd shooter? Lente is a no brainer she needs to go to pink. One could argue Sure Shot in place of Marksman but that is just preference. She has great traits. It's good to have a 2nd Shooter but Def Stance rules out Ann for me. I can live with Vigilant and use Shooters with that all the time. For your Assaults you'll want to see Norma's 5th trait. If she gets Dodge you'll have the unicorn. 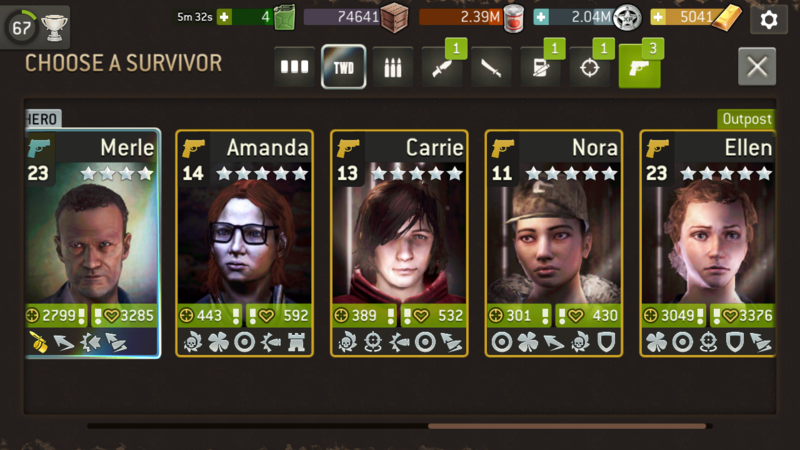 I have those traits and it makes a very effective survivor for Assault class, She'd still be worthwhile with Ruthless or Revenge (in that order) but for me Revenge is on my 2nd Assault, not primary. If Jimmy gets Lucky for his 5th trait he'd be a keeper too although if Norma gets Revenge and you keep her I wouldn't invest anymore in Jimmy. If Iron Skin or Ruthless showed up for Jimmy that might be ok too. I'd prefer Ruthless and make him an offensive power, then use badges to increase his health. Lot's of potential here. Great! Thanks for your advice. I went for Norma and her 5th trait is ruthless. @Cronus : Do I still need Jimmy or do I make tokens of him? Take the tokens... use them on Lente. Keep Norma, but I would not use any tokens on her. 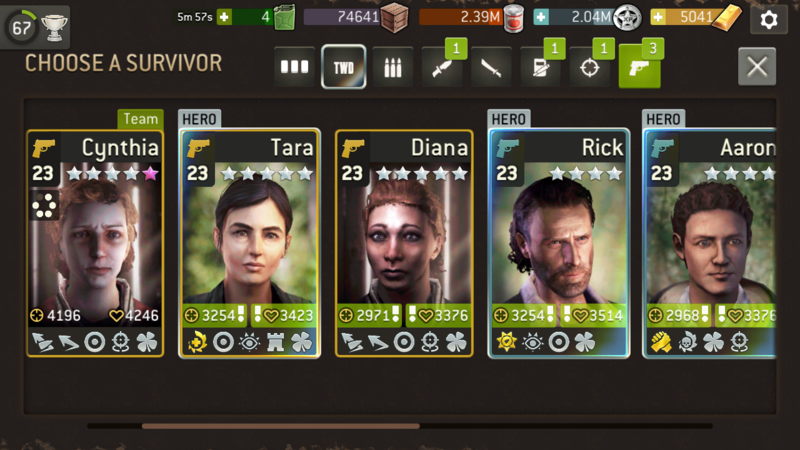 Wait for a Legendary... with your luck you may pull another unicorn. Ruthless is a good pull for Norma. Her charged attacks will carry a punch. 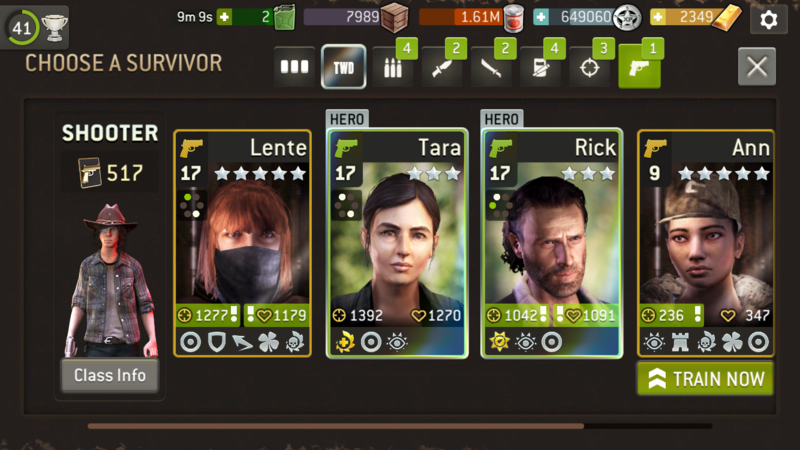 Being a ranged survivor the absence of Dodge, for me at least and how I play, is not the end of the world. I like to keep my Assaulters out of harms way but they don't have the range of a Hunter or Shooter so sometimes I do get too close. Norma has a really good balance of traits so I'd keep investing tokens in her. I'm not sure I'd retire Jimmy just yet, at least not until a better option comes along. I have a 2nd Assault with Lucky-Dodge-Sure Shot-Ruthless-Revenge and when paired with my unicorn primary they do a lot of damage together. 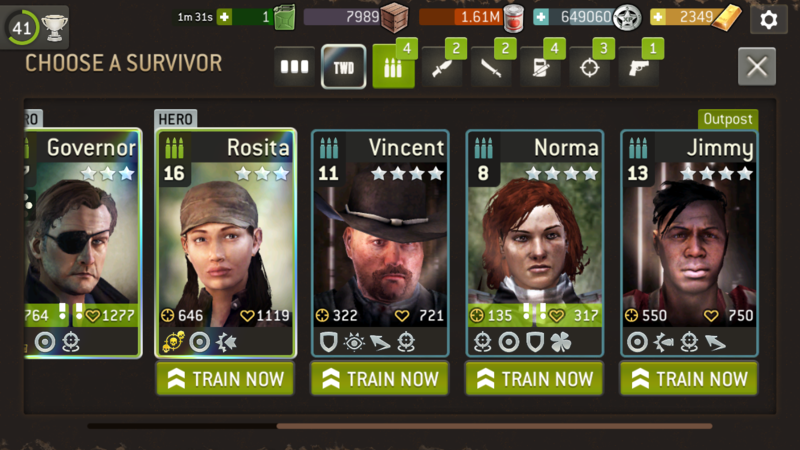 You still have awhile to go in this game so learn to use Norma and her traits and you can make a better informed decision on Jimmy down the road a bit. I need some advice please... I've just got a shooter with the same traits as Lente, but was hoping for sureshot as last trait. Should I make her double pink? I also need to get rid of a few, which two? Thank your for your advice, but don't you want to have sureshot? I won't scrap more than two, need some pawns in the Distance. Pace yourself, learn how to use each trait, and get Nora trained up and badged. You will not regret it. I would dump Diana and Carrie and put the tokens on Nora. Sure shot is a great trait, my best shooter has it but I think I would rather have ruthless. Once you get to RSL+5 it becomes a useless trait unless piercing kicks in. Sure shot and ruthless are both must haves for me on shooters. Thanks all. I havn't made up my mind yet, but Nora is in training. I've been looking for a better shooter for over a year now... so perhaps I will go with her. What badges would you prefer on her? Do Crit damage increase the damage on ruthless?